Are We There Yet?? : The Elusive "Oh, If I Could Just Win the Lottery" Dream! The Elusive "Oh, If I Could Just Win the Lottery" Dream! Wow, it's Saturday already - how did that happen?? Even though I've been rather busy taking and editing pictures I've really been enjoying my time back in Vermont at the Inn Victoria. I need to learn to lay off the shutter button a little bit so that I don't have quite so many pictures to then edit but eh, what can I say? If I take 600 and 100 come out good then I'm happy and considering I'm taking new pictures for the Inn's website I want to make sure that Dan and Penny - the innkeepers - are happy, too. After all, I got a wonderful weekend out of the deal so I want to make sure that they get wonderful pictures in exchange. Speaking of wonderful and happy ... my room has a beautiful hydro-massage tub complete with "mood lighting" that I have absolutely fallen in love with that is totally wonderful and makes me completely happy! I haven't figured out how to sneak it out of the house without Penny and Dan noticing so I guess I'm going to have to leave it here for the next guests to enjoy but it's going to be tough as I'm really going to miss it when I go home. 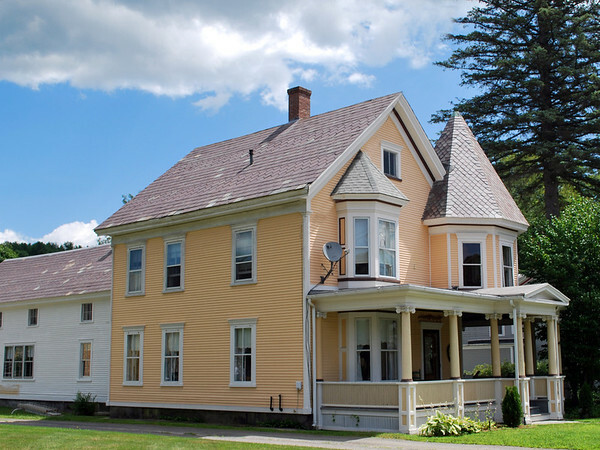 Speaking of home, there is a gorgeous house across the street from the inn that's for sale that I really wish that I could call home; I first noticed it when Jamie and I were here in May and it's just one of those houses that makes a person yearn for home ownership. Isn't it just the prettiest thing? It's got a fantastic front porch that wraps around to the side, it's got a turret, it's got a nice yard, and it's located right on Main Street in one of the nicest little towns I've ever been to. I swear Chester is one of those places where time just kind of stopped and it's like something out of a Rockwell painting or off of a Currier & Ives card. Now if only I could win the lottery, I'd buy this place in a New York minute and put a big master bathroom in that front turret with one of those nice hydro-massage tubs - then I'd be happy and relaxed all the time! Ah, dreams ... you've got to have them, right? It would probably help if I occasionally bought a lottery ticket though, eh? Ah, that old (and ever present by necessity) dream of winning the lottery, huh? Maybe you and I should join forces and buy tickets? I may say I want/need to win the great big -preferably the biggest jackpot ever -but in reality, I'd be more than willing to split it, fifty-fifty, as I think, no I'm sure, I could exist nicely on a smaller share of just winning that, couldn't you? Keep on dreaming Linda because if you stop doing that you know you won't be able to see the beauty that you find all around you now! Ummmm, yup, buying a lottery ticket would indeed be a good start at winning! lol I get excited when I win $10, imagine if I ever won the BIG one?? That house is absolutely gorgeous and I'm surprised it hasn't been snapped up already by someone who can afford it!! Oh, that tub is fabulous! So you traded photography talent for a weekend at the Inn? Brilliant! And that house is ginourmous! You'd have to win the lottery just to heat and cool it! And imagine the maintenance and repairs? My head is spinning! Now I'm going to have ♪♫ for they're only fleeting things, My Elusive Dreams ♫♪ as my earworm for the rest of the day... I prefer the Charlie Rich version, if that's OK with you. you have the MOST fantastic life!!!!! Ah that dream of swirling warm water, candle light, scented air ... imagination is so much fun. Shoot, Y'all. If she won the lottery BIG, she wouldn't have to worry about the heating/cooling costs! I whole-heartedly agree with Bee. Being able to do what you do is wonderful! And that's a great trade! My dear, I think you've "arrived"